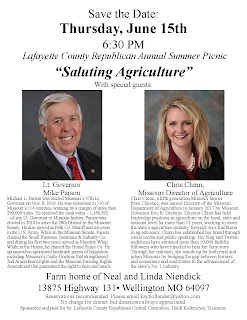 Register now for "Saluting Agriculture" event in Lafayette County. Date: Thursday, June 15th. Time: 6:30 PM. See details below. Location: Farm home of Neal and Linda Niendick, 13875 Highway 131, Wellington, MO. Reservations: strongly recommended; no charge for dinner, but donations always welcome. BIO: Michael L. Parson was elected Missouri’s 47th Lieutenant Governor on November 8, 2016. He was victorious in 110 of Missouri’s 114 counties, winning by a margin of more than 290,000 votes. He received the most votes – 1,459,392 – of any Lieutenant Governor in Missouri history. Parson was elected in 2010 to serve the 28th District in the Missouri Senate. 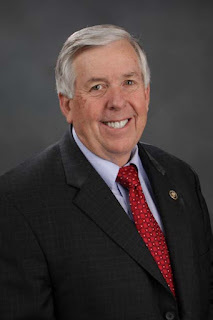 Before being elected to the House of Representatives in 2004, Parson served as the Polk County Sheriff and six years in the U.S. Army. While in the Missouri Senate, Parson chaired the Small Business, Insurance & Industry Committee and during his first two years served as Majority Whip. While serving in the House of Representatives, he was chair of the House Rules Committee. 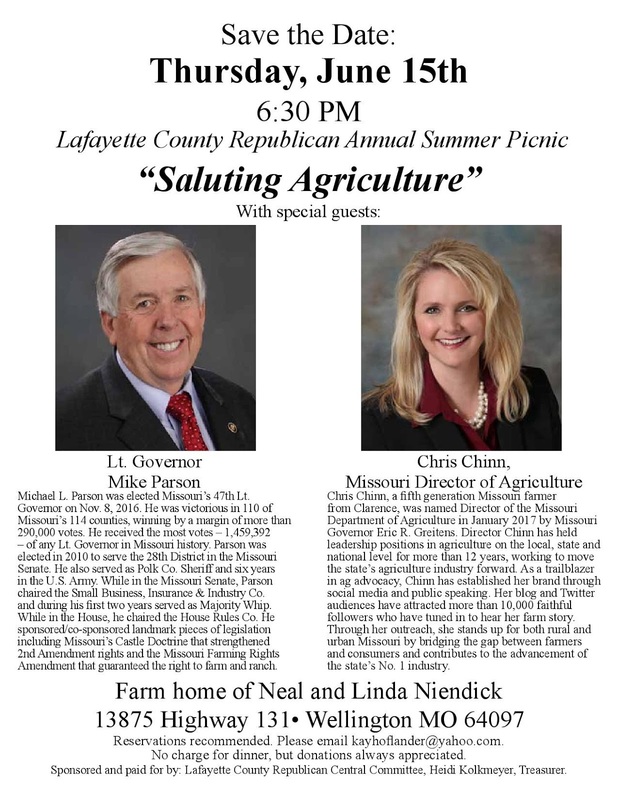 He sponsored and co-sponsored several landmark pieces of legislation including Missouri’s Castle Doctrine which strengthened 2nd Amendment rights, and the Missouri Farming Rights Amendment which guarantees all Missourians the right to farm and ranch. BIO: Chris Chinn, a fifth generation Missouri farmer from Clarence, was named Director of the Missouri Department of Agriculture in January 2017 by Missouri Governor Eric R. Greitens. 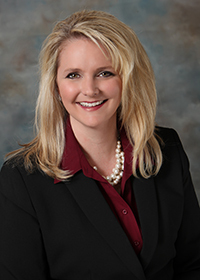 Director Chinn has held leadership positions in agriculture on the local, state and national level for more than 12 years, working to move the state’s agriculture industry forward. As a trailblazer in ag advocacy, Chinn has established her brand through social media and public speaking. Her blog and Twitter audiences have attracted more than 10,000 faithful followers who have tuned in to hear her farm story. Through her outreach, she stands up for both rural and urban Missouri by bridging the gap between farmers and consumers and contributes to the advancement of the state’s No. 1 industry. Paid for by: Lafayette County Republican Central Committee, Heidi Kolkmeyer, Treasurer.